When seconds can mean the difference between life and death, an ambulance can provide vital assistance, transporting the critically injured to the nearest emergency room or hospital. This commonly means that ambulance drivers need to exceed the speed limit, run stop signs and red lights, weave through traffic and engage in other dangerous driving habits. These risky and unpredictable maneuvers can make ambulances – and the vehicles they share the road with – highly vulnerable to accidents. Ironically, this can result in ambulances actually causing injuries and harm, rather than helping those who have been hurt. Pursue all of the available legal remedies to help you maximize your financial recovery. Hurt in an Ambulance Accident? During your FREE consultation, we will review your potential claim, explain your rights and advise you of your legal options. Free virtual and mobile consultations are also available for those who cannot visit our offices. Any number of factors can cause an ambulance accident. In some cases, these factors may be unpredictable and/or unpreventable. In others, preventable negligence can cause or contribute to these crashes. 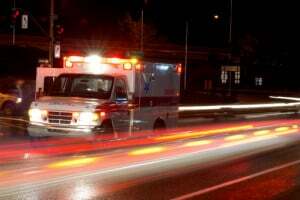 Ambulance driver negligence – When sirens are on and ambulances are responding to emergencies, ambulance drivers can have some leeway with traffic laws (in that they can travel at higher speeds, run stop signs, etc.). This, however, does not mean that ambulance drivers are exempt from complying with traffic laws or from taking the proper safety precautions (regardless of whether sirens are on). Driving while impaired, which can include driving under the influence of alcohol/drugs or driving while fatigued, both of which can impair drivers’ perception and reaction times. Otherwise failing to abide by traffic laws in the presence of an ambulance. They hire drivers with a history of reckless driving and/or violating traffic laws. They fail to properly train drivers or equip them with the necessary safety equipment. They fail to properly maintain their vehicles. Their policies or procedures (or a lack of them) increase the risk of ambulance crashes. Vehicle equipment makers can be liable if equipment failures or malfunctions contribute to these crashes. Counties, municipalities, etc. can be liable if dangerous road conditions were a factor. Hospitals can be liable if their policies or procedures contribute to ambulance accidents. Please be aware that multiple parties can be liable for a single ambulance accident. There are about 4,500 ambulance accidents. At least 30 of these crashes cause fatal injuries. Nearly 9 out of every 10 ambulance crashes involve at least one other vehicle (i.e., a vehicle other than the ambulance). Close to half of all ambulance crashes happen when the vehicle is in emergency use (i.e., when lights and sirens are activated). At least half of all injury-related ambulance crashes harm those who are not inside the ambulance (i.e., other motorists, passengers and travelers sharing the road with the ambulance). The high speeds and heavy loads associated with ambulances can make accidents involving these vehicles particularly catastrophic – especially when these crashes also involve smaller vehicles, motorcyclists and/or pedestrians. Those harmed in ambulance crashes – including accident victims and families who lost a loved one to these wrecks – can have a number of options for taking legal action against those liable for the accident. The attorneys at the Amaro Law Firm can help you figure out and pursue your best options for seeking compensation and justice in the aftermath of an ambulance crash. While we understand money cannot reverse the permanent losses caused by these accidents, we also know that the recoveries from these cases can provide essential financial support to help victims seek treatment and rebuild their lives. Our lawyers have the skills, insight and resources to help you position an ambulance accident claim for success and the maximum financial recovery. A Houston motor vehicle accident lawyer at the Amaro Law Firm is ready to help you recover from an ambulance accident by advocating your rights to compensation and justice. Tenacious, experienced and diligent, our lawyers will provide you with exceptional representation and personal legal service as we strive to build you the strongest possible claim – and bring that claim to the best possible resolution.